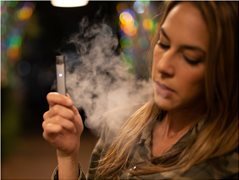 The casting team at Raw Research are looking for ex-smokers who now vape aged 30-50 (both men and women) a test film we're making - the film is not for broadcast, but rather just for internal use and pitching ideas. We are looking for people who live in London or the South-East of England. They must have a good story about how vaping instead smoking has made in their lives better. We are looking for people who are cool and interesting - ideally makers or creators of some description - e.g. a chef, woodworker, gardener, musician etc. Anyone selected for filming would be needed for a day or two around the 25th of February - ideally we would like to film everyone in their own environment - e.g. home / work / social environment (this is crucial). We are able to pay the cast £500 each per day.